Ah, tower defense. What is it about building towers to destroy hordes upon hordes of mobs that's so addicting, yet so very therapeutic? We may never know the answer to this question, but one thing we do know is that as great as tower defense is solo, it becomes infinitely better with co-op play. 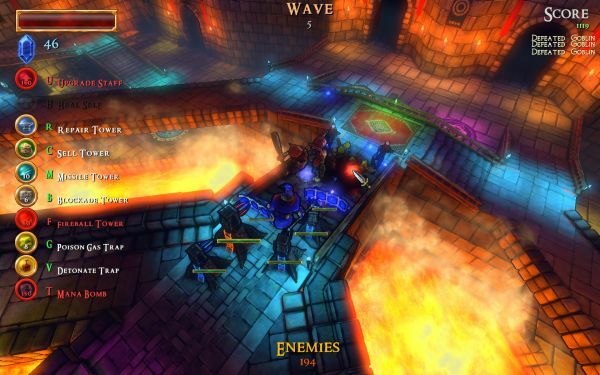 Dungeon Defense by Trendy Entertainment promises to offer such a co-op tower defense experience, and for the very affordable price of free. The game is being developed with the Unreal Development Kit (UDK), which is the free version of the Unreal Engine 3, and after just four weeks of development the demo is now available to the public. While it appears that the demo only offers single player, the game will support up to four players working together cooperatively to defend the Crystal Core in the center of the map. Players combat up to ten waves of creatures, each wave significantly more difficult than the last, with spells, upgradable staff attacks, and, of course, various towers which they can strategically place along the paths. The mobs drop gems which players can use to purchase said upgrades and items. The game also looks to have gamepad support, which is good news for all the gamepad fans out there. You can also check out Dungeon Defense's source code, gameplay trailer, and developer blogs about their development process on the Epic Games forums. Page created in 0.6881 seconds.